. . .I don't suppose he need trouble you much. If you've made up your mind about it, I think you might as well ask her at once." From all which it may be seen that Miss Mackenzie had been invited to the Cedars with a direct object on the part of Mr Ball. But though the old gentleman thus strongly advised instant action, nothing was done during Christmas week, nor had any hint been given up to the end of the year. John Ball, however, had not altogether lost his time, and had played the part of middle-aged lover better than might have been expected from one the whole tenor of whose life was so thoroughly unromantic. He did manage to make himself pleasant to Miss Mackenzie, and so far ingratiated himself with her that he won much of her confidence in regard to money matters. This is my second reading of the unforgettable Miss Mackenzie. I liked it even better than the first go-around. It is really a fine example of Trollope's depth, as well as his inimitable and often humorous character portrayals. A very pleasant read, although the story itself could have easily ended 50 pages sooner. 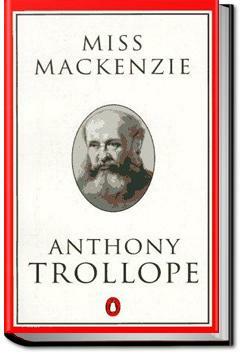 However, the filler created by Trollope was also enjoyable. It was an interesting portrait of a woman on her own in 19th century England. I became quite attached to Miss Mackenzie and absorbed in her story.